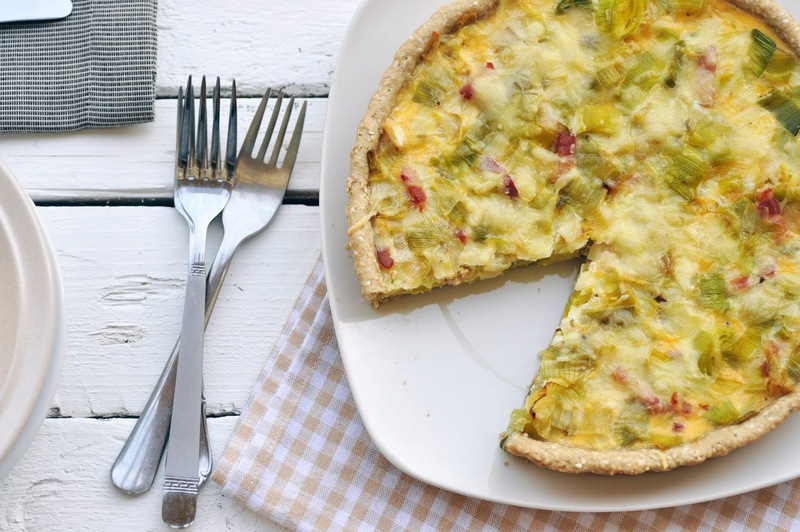 Savory tarts and quiches are perfect winter comfort foods. Now that winter (note: that is Dubai winter with around 20C) and some rain have finally arrived, I felt like making some tart. After I saw many Brussels sprouts and bacon recipes popping up in the food blogs recently, I thought that would be a nice tart filling combination. Unfortunately, I didn't get any Brussels sprouts on that particular day, so I threw in leeks instead. The result was a real success. The crust is probably the most important part of the whole thing as it is the actual comfort food. It turned out really well with the measures listed below using whole wheat flour. The filling was a very tasty combination of the rather mild leeks spiced up with smoky bacon. I am not a vegetarian, but I don't like meat-loaded dishes. Bacon is a good way of getting some meaty flavors into a dish, without using much of it. That way, the dish keeps light and easy to digest. I also like the fact that the whole thing is held together by a light and rather low-calorie mixture of milk and a couple of eggs. We'll definitely have more tarts soon, and explore different tart fillings. I guess you can use whatever vegetable(s) you fancy and even omit the bacon if you prefer a vegetarian tart, by spicing it up with herbs and spices. Spread the oats and sesame seeds on a baking sheet and toast in the oven for 8 minutes. Transfer oats and sesame seeds to the bowl of a food processor fitted with a metal blade. Add flour and salt. Process until the oats are finely ground. In a medium bowl, whisk together the water and oil. Slowly add the oil mixture to the flour mixture in the food processor. Blend until it forms a dough. Roll out the dough on a lightly floured surface. Put the dough in the tart pan. Press it down evenly, making sure to fill in the fluted sides of the pan. Trim the tart of any excess dough. Prick the dough with a fork. Prebake for 15 minutes or until lightly browned. Set aside. Place the bacon strips (fat parts cut off) on a baking tray and cook them in the oven until crisp, about 10 minutes. Turn them over halfway. Heat one tablespoon of olive oil over medium heat in pan that has a lid. Saute the chopped onion until golden brown. Add the leek rings and saute for another 3-4 minutes. Season with salt, pepper and nutmeg. Keep stirring. Add a few tablespoons (about 1/8 of a cup) of water to the leek mixture, put the lid on the pan and cook over high heat until leek is soft, about 3 minutes. All water should have disappeared from the bottom of the pan. Combine egg and milk in a bowl and season with salt and pepper. Stir well. Pour the milk mixture over the leeks mixture. Sprinkle grated cheese onto the pre-baked tart crust. Pour the leeks milk mixture on top and sprinkle more cheese on top. Bake the tart for 20-30 minutes. Let settle for another 5-10 minutes before serving.